The LapSac is packaged as a flattened sheet and an introducer is required to aid in placing the bag intracorporeally (Fig. 1). The introducer is a stainless steel instrument with two prongs (25.5cm) and an aluminum handle. One prong is introduced into the LapSac, opposite the side where the drawstring exits. Then, the bag is tightly rolled around the introducer to create a small-diameter cylinder. 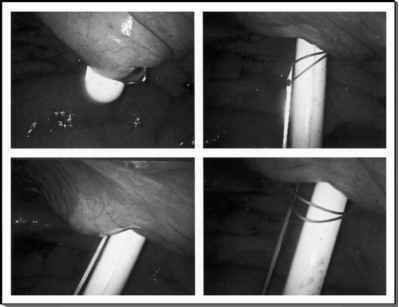 The entire unit of bag and introducer is introduced into the abdomen through the largest trocar, preferably 11 or 12mm, after the specimen is placed lower in the abdomen. The bag is grasped with atraumatic forceps and slid off the introducer, aided by an in-and-out pushing motion of the introducer. Once the bag and string are entirely within the body, it is unrolled in the upper abdomen on either the spleen or liver for the left and right side, respectively.